Another beauty find, and as my friend L calls it - a miracle product! Everyone, let me introduce Shu Uemura's cleansing oil! With all the gunk we apply to our faces on a daily basis - foundation, bb cream, powder and what-have-yous, it is definitely a must to have a cleanser product that completely removes makeup effectively with no residue. I have been looking for that perfect product for a long time. I have tried cleansing milk removers to the drugstore oil-based makeup removers, but none of them gave me that 100% cleanser effect even when I'm just wearing light makeup. Imagine if I were to attend an event or a makeup artist had to work on my face, then taking off the makeup would indeed be a pain in the face, literally! Here's the test on whether your makeup remover does its job well. After using your makeup remover, you follow it up with your cleanser and toner. After applying toner, you still notice that there's still a bit of makeup on your cotton. That was always the case when I was using the commercial and drugstore cleansing milk removers and oil-based removers. Another friend, A, introduced us to Shu Uemura's cleansing oil and after buying a bottle for myself ($45 for the 150ml. bottle at the Shu Uemura store) let me just say, WOW! For just 2-4 pumps, it doubles as a makeup remover and a cleanser too. Many people may think that a cleansing oil is the first step of a cleansing regimen. But with this cleansing product, it's just what you need! Shu Uemura Cleansing Oil is your one-step regimen, you wouldn't need any cleanser or toner afterwards, trust me. I love how it easily removes trace of makeup and other impurities, leaving a smooth, soft, clean feeling. When it comes out of the bottle, it's very oily and it may feel weird rubbing oil all over your face. Immediately, with gentle massaging, you would see how the lipstick, foundation, mascara comes off without a fuss. And the smell, I love the fresh smell! Apply a bit of water, tap unto your face and the oil becomes a creamy/milky texture - that's the cleanser part. And voila, you're done! Seriously, that's just it! No more extra steps or what. It doesn't dry out skin. There's no residue and no sticky feeling afterwards. And best of all, it works for my sensitive skin too. The cleansing oils are customized depending on your skin type and needs. I am currently using the Whitefficient Clear Brightening Gentle Cleansing Oil (purple bottle). My experience with the product is great. When I'll be done with this bottle, I'm switching to the High Performance Balancing Cleanser Oil (yellow bottle) as it fits my dry-combination skin type. I'll let you know how that one goes. 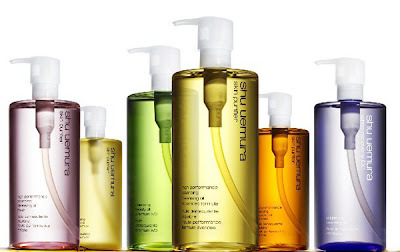 For more details regarding their cleansing oils, visit the Shu Uemura site.